Micky Mouse. Toy Story. Shrek. These are all things we think about when we hear the word "animation". But animation can be used for so much more than just telling a story with cartoon characters. Animation, can actually be used to capture change over time, in a variety of different ways. Specifically, stop-motion animation is a great way to create video from individual, still images. Stop-motion animation can help to create a video-like effect that captures some form of change over time, and bring real world experiences to life. 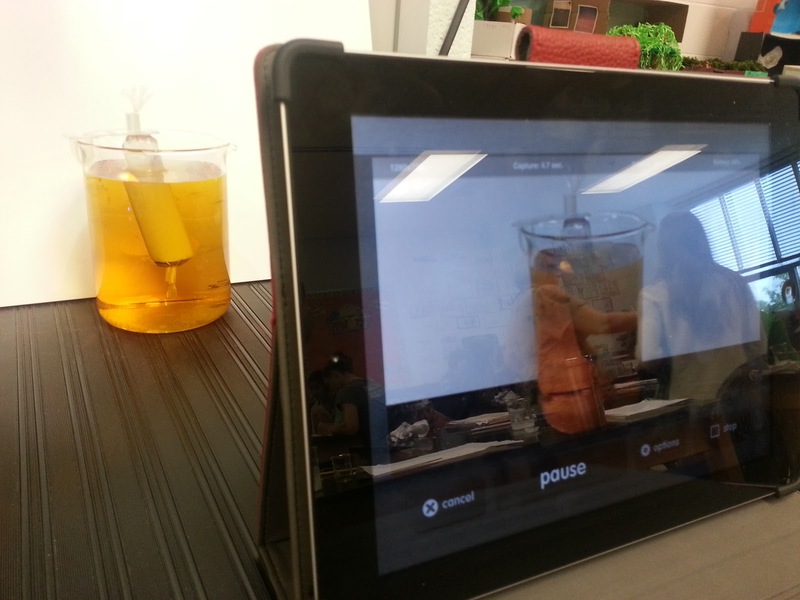 Recently, I used the iMotion HD app with my students for two very different learning activities. They both involved science, but they were two different lessons, in two different classrooms, by two different teachers. 1. The first activity required students discover a particular science concept to which they were not familiar. Their task was to create a hypothesis, then perform a set of directions to test their hypothesis. The students hypothesized that they were going to notice some kind of "change over time", so we decided to capture their experiment on camera. Using the iMotion HD app on the iPad, a group of students were able to create a stop-motion animation video by programming the app to take pictures of their experiment every 10 seconds for about 15 minutes. What the students observed was truly amazing! After observing the video, the students were able to conclude that they witnessed a case of diffusion. By definition, diffusion is "The movement of atoms or molecules from an area of higher concentration to an area of lower concentration. Atoms and small molecules can move across a cell membrane by diffusion" (reference source). In this example, students were empowered to make this discovery on their own by observing the diffusion of iodine in a beaker. This was a really powerful learning activity and it was fun to witness all of the "ah-ha" moments when the students observed this scientific transformation in real life. Better yet, was the fact that students could rewind the video to see the specific stages of diffusion again and again. 2. The second learning activity involved observing the metamorphosis process over a span of two weeks. Again, using the iMotion HD app, I was able to program an iPod Touch to take a picture every 30 minutes, for two weeks straight. We were able to capture every stage of metamorphosis with a total of over 850 pictures. Below is the stop-motion video created at 10 frames per second. How might stop-motion animation be used in other science experiments? In other subjects? How might you be able to use iMotion HD in your classroom? Why is it important to empower our students to explore, and make their own discoveries? How might capturing these classroom activities help students to reflect on their learning?